US Secretary of State John Kerry has said Brexit must not impact the push for peace in Northern Ireland. Mr Kerry was speaking during his visit to Ireland to receive the Tipperary International Peace Award for 2015. Previous winners include Nobel peace prize winners Nelson Mandela and Malala Yousafzai, UN general secretary Ban Ki-moon, former president Mary McAleese and her husband Martin, and Bob Geldof. Mr Kerry was also here to meet Minister for Foreign Affairs Charlie Flanagan. The pair held bilateral discussions ahead of the ceremony. US special envoy to Northern Ireland Senator Gary Hart also attended the talks. At a press conference following their bilateral meeting in Tipperary, Mr Flanagan said he was surprised and concerned at the remarks of DUP Leader Arlene Foster claiming the Irish Government was talking down the North and poaching investors. Mr Flanagan said he had spoken to Northern Trade Secretary Simon Hamilton and they had agreed to work together. 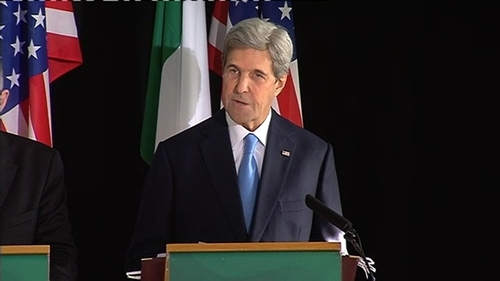 Meanwhile, Mr Kerry announced the expansion of a one-year internship programme for Irish J1 students in America. Speaking about efforts for peace in Syria, Mr Kerry said he believed a breakthrough was possible before the end of the current US administration. Five groups involved in the anti-war movement in Ireland - Galway Alliance Against War, the Irish Anti-War Movement, the Peace and Neutrality Alliance, Shannonwatch and Veterans for Peace - criticised the selection of Mr Kerry for a peace award. During his visit to Ireland, Mr Kerry said he had not been contacted by the FBI about new investigative steps being taken related to Hillary Clinton's use of a private email server. "No, I haven't been notified of anything, no, I haven't been requested of anything, no, I'm not aware of the department being requested, and I have no further comment to make," Mr Kerry said. "As an American citizen and former nominee of the party, there is a lot I'd like to say about what is going on, but I can't and I am just going to remain out of this," he added.